If you want more love, give more love. If you want more money, give more money. If you want more success, help someone be successful. It is that simple. The only thing is, that it must come from a pure heart with pure intentions and not for your own gain. So be a kind man for all mankind. Want to learn how to apply these universal laws into your life and begin living a life full of fun, joy and prosperity. Have you ever taking an inventory of yourself? It is not something to take lightly. It is studying yourself under difference situations and accurately taking account of yourself. To be true to you! 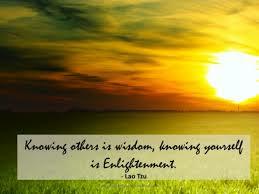 The more you know yourself, the more you will know others as well. Not as they appear to be, but as they really are. The tone of their voice, posture, eye contact, the use of their words and how they act under pressure, when angry, in love, when they have money, or not have any, how and when they eat, when losing in a game or sport, winning, when their alone and so forth. This is not about judgement but rather observation, of oneself and others. Judgement is weakness and observation is strength. The whole point of being true to you is to become all that you can be in this world and to know others is to become successful in life. Humility is a forerunner of success. Until we become humble in our own hearts we will not be able to connect and get into the minds of others. So take a good look at yourself and observe yourself like never before. Before long, you will become true to you!